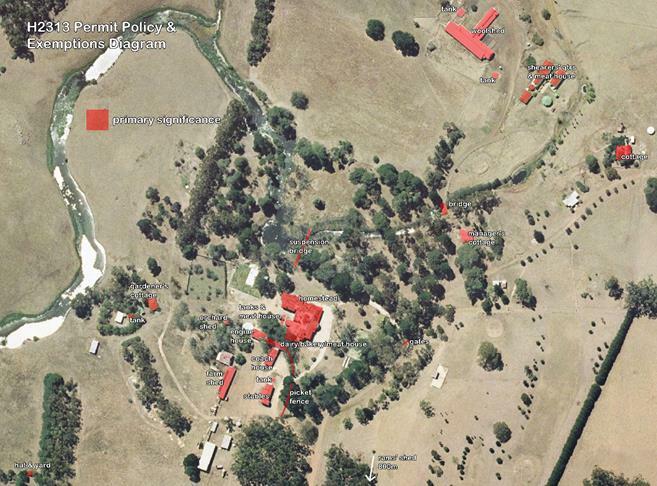 Barunah Plains including the homestead, stables, dairy and bakehouse, coach house, engine house, farm shed, manager's cottage, cottage, woolshed, shearers' quarters, suspension bridge, gardener's cottage, orchard shed, water tanks, meat houses, rams' shed and remnant garden. Barunah Plains developed into a substantial and prosperous farming complex after acquisition by brothers Thomas and Philip Russell, and their cousin John Simson, in 1851. Originally known as Long Water Hole, the land was a pastoralist run from the late 1830s and leased by James Austin from the late 1840s. During the nineteenth century the pioneering Russell family became extensive landowners in western Victoria and by the 1880s Barunah Plains had developed into a leading merino sheep establishment. A house was constructed on the site in 1867 to designs by local architects Davidson and Henderson, and substantial additions increased the size of the homestead in the boom period of the 1880s. 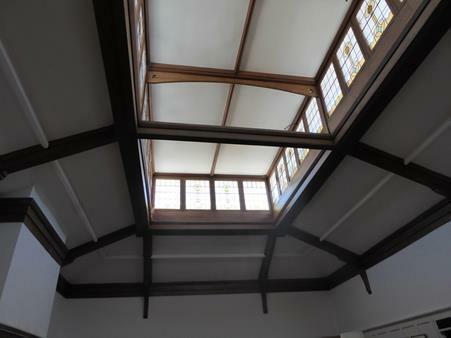 Further additions designed by Geelong architects Tombs and Durran in 1903 contain outstanding Arts and Crafts style interiors. 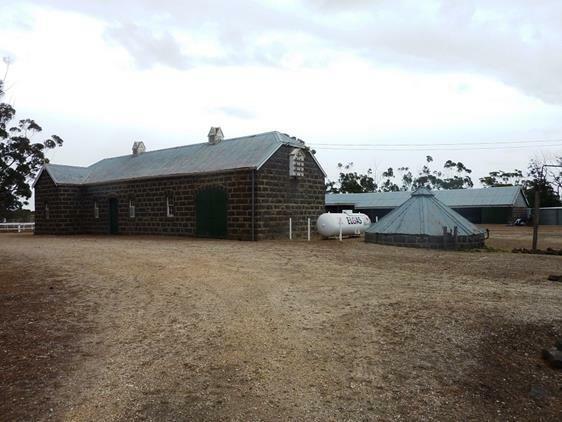 A number of substantial bluestone outbuildings, including a large woolshed, were constructed at the property as it developed into a successful farming complex. The 20,000 hectare property was reduced to about half its size after soldier settlement subdivision in 1949, however successive generations of the Russell family continued to live at Barunah Plains until 1978. In the 1990s a golf course was added to the property and this operated as a tourist facility for a period of time. 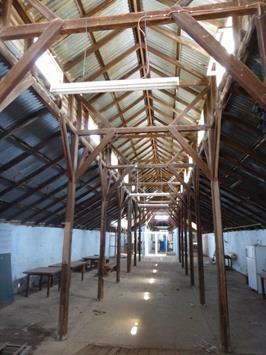 Barunah Plains is a farm complex situated on the Warrambine Creek. 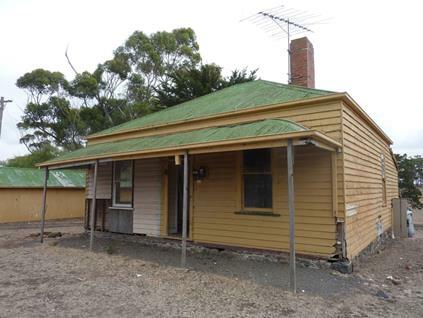 It includes a large single storey, bluestone homestead which has been constructed in stages. It consists of a number of protruding bays, turret-like roofs and a return verandah which address lawned areas to the north and east. 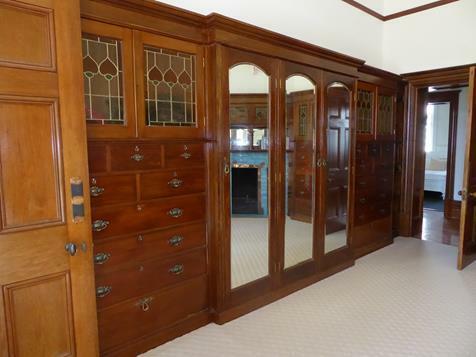 Exceptional Arts and Crafts detailing can be seen throughout the house, in particular in the west wing and central ballroom, where outstanding examples of stained timber, metal and tile work and stained glass are located. 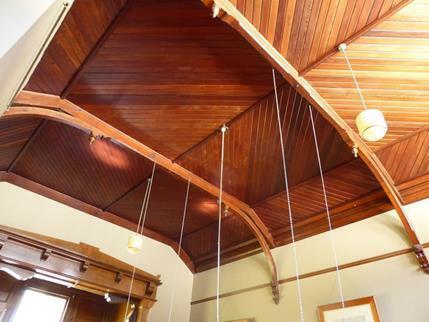 Interior detailing from the boom period has also been retained, including embossed wallpaper in the main entrance and a timber lined coved ceiling in the billiard room. A number of original outbuildings and structures have been retained. The majority are constructed of bluestone, including a large t-shaped woolshed, stables, dairy and bakehouse, coach house, farm shed, rams' shed, manager's house, cottage and water tanks. 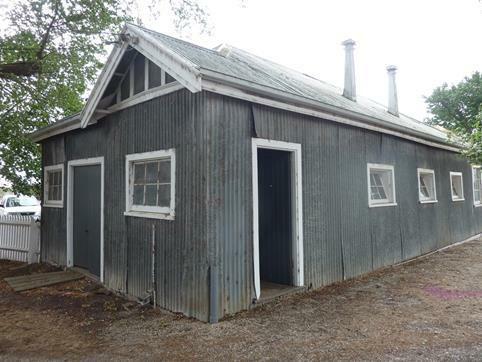 A corrugated iron clad engine house contains original electrical power plant machinery. Remnants of the original formal homestead garden and parkland remain. Early structures include a suspension bridge over the Warrambine Creek. This site is part of the traditional land of the people of the Kulin Nation. All of the place shown hatched on Diagram 2313 encompassing part of Lot 1 on Plan of Subdivision 549946, all of Crown Allotment 17F and parts of Crown Allotments 2002 and 2008 Parish of Hesse, and all of a former unnamed road reserve. European exploration and settlement of Victoria commenced in the 1830s and large numbers of squatters settled in the Western District of Victoria after the Henty brothers landed in Portland Bay in November 1834. Many settlers came from Scotland via Van Diemen's Land in search of land on which to establish pastoral runs and by 1837 fleets of ships conveyed flocks of sheep from Van Diemen's Land to Geelong, destined for the open plains to the west. By the mid-1840s there were some 282 runs in the rich Western District of Port Phillip and a population of nearly 3,500 compared to almost 11,000 in Melbourne and 1,300 in Geelong. Amongst the early pastoral settlers in Victoria was the Russell family. George Russell arrived in Van Diemen's Land from Scotland in 1831, and in 1836 travelled to Port Phillip. He became manager of the pastoral Clyde Company, a joint stock concern formed in Scotland in 1836, and, together with his brother Philip, George represented this large Scottish company in Port Phillip. George Russell moved his headquarters from the Moorabool River near Geelong to the Leigh River at Shelford in the Western District of Port Phillip in 1839. It was here that he secured his Golf Hill (originally Golfhill) homestead by the purchase of 4,231 acres (1,712 hectares) from the Crown in 1842. He farmed cattle and large numbers of sheep on this land and had a substantial brick cottage built in 1846-47. After the Clyde Company was dissolved in 1857-58, George Russell bought the central Golf Hill freehold of 8,500 acres (3,440 hectares) which he eventually enlarged to 28,000 acres (11,331 hectares). He lived there until his death in 1888. 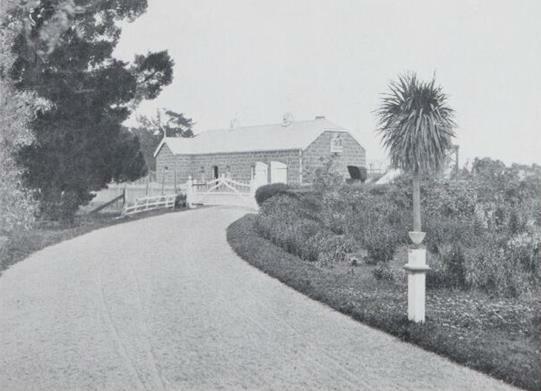 A number of members of the Russell family left Scotland and settled in a similar part of the Western District of Victoria. This included George's first cousin Thomas Russell who, in partnership with his brother Philip and cousin John Simson, acquired the run known as Long Water Hole (later Barunah Plains) from James Austin in 1851. James Austin, and his brother Thomas, had arrived in the district from Van Diemen's Land in 1837 and they both acquired a number of pastoral holdings in Victoria. Austin had already established a sheep stud at Long Water Hole when the run was acquired by the Russell partnership. 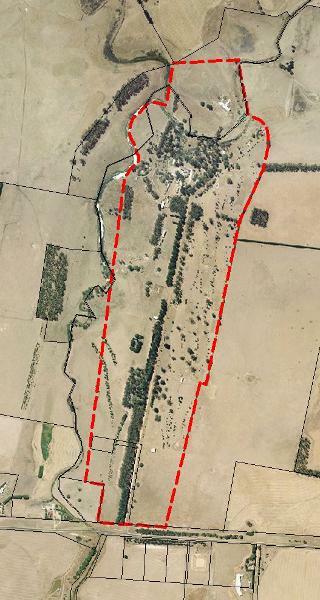 Located on the Warrambine Creek, this run was situated to the west of George's property Golf Hill. John Simson and Philip Russell soon withdrew from the ownership and were replaced by three British-based Russell brothers. Together they became constituents of the company known as Thomas Russell and Co. Thomas Russell continued to expand his land holdings at this location, and early in 1857 acquired the adjoining Wurrock station, which became his headquarters. Thomas Russell was elected councillor and first President of the Shire of Leigh in 1862 and continued in this role for a number of years. In 1868-73 Thomas was member for Grenville in the Legislative Assembly. The Russell family continued their involvement in local government for a number of years. George Russell was President of the Leigh Shire from 1869-71 and James Russell from 1890-92 and 1899-1903. Other Russell family members settled in the Western District, including Alexander Russell at Mawallok, Beaufort (VHR H0563), Philip (and later James) at Carngham, and George at Langi Willi, Skipton. Alexander Davidson and George Henderson were both trained in the office of Edinburgh architect John Henderson (George's father) over the years 1858-62. Alexander Davidson arrived in Victoria from Scotland in 1864 and immediately went to live in Rokewood, north-west of Geelong, near the Barunah Plains station. He was familiar with the Presbyterian minister at Rokewood, John Cooper, and was introduced to many Scottish Western District settlers. As a result he established a successful architectural practice by 1866 and developed contacts and associations amongst the squattocracy in the immediate district. By mid-1867 Davidson had secured the patronage of Thomas Russell with a tender advertised for construction of a stone cottage at Wurrock and cutting drains through the swamp at Barunah Plains that year. Former architectural associate, George Henderson, arrived from Scotland and joined Davidson in practice at Rokewood in May 1867. This partnership became a highly influential and significant Western District architectural practice for the next ten years. Henderson spent his first weeks in Victoria surveying a swamp at Barunah Plains for drainage. The partnership received its first important commission in July that year - a new homestead at Barunah Plains for Russell and James Kininmouth - and this was closely followed by a commission for additions to Yarima, Cressy for John Elder and additions to Wurrock for Thomas Russell. 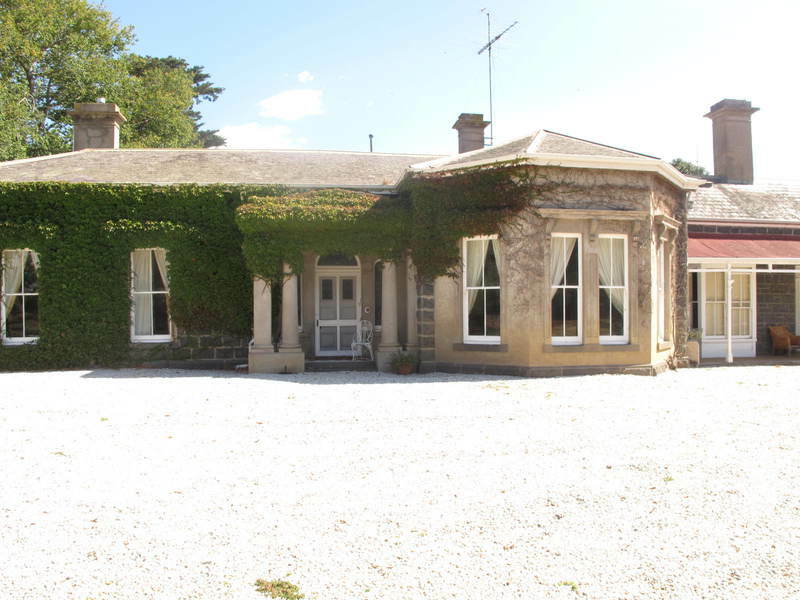 The design of many homesteads in the Western District of Victoria followed, including a major commission for Thomas Austin in 1869 at Barwon Park, Inverleigh (VHR H0365). Davidson and Henderson formed an official partnership on 1 January 1869 and the practice moved to Geelong. A large volume of work was completed before the partnership was dissolved in 1877. Davidson continued to practise in Geelong and Henderson returned to Scotland. 2. The architects of the second stage of the existing Barunah Plains homestead c1886 have not been established. 3. Tombs and Durran - Architects of the third stage of the existing Barunah Plains homestead in 1903. James Durran was born in Geelong in 1861 and his future partner, William Tombs, was born in New Zealand in 1866. Tombs began work in Geelong in 1889 and in 1895 joined the partnership of Watts and Durran. This architectural firm became Watts, Tombs and Durran and later Tombs and Durran. Architects Tombs and Durran gained a number of commissions throughout the late 1890s and early 1900s, particularly domestic work. These early commissions were located in Geelong , however an increase in commissions in the Western District of Victoria led to the establishment of a branch office in Colac. This practice continued until the death of James Durran in a car accident in 1912. These architects executed a variety of work including offices, hospitals, banks, hotels and a large number of private residences. 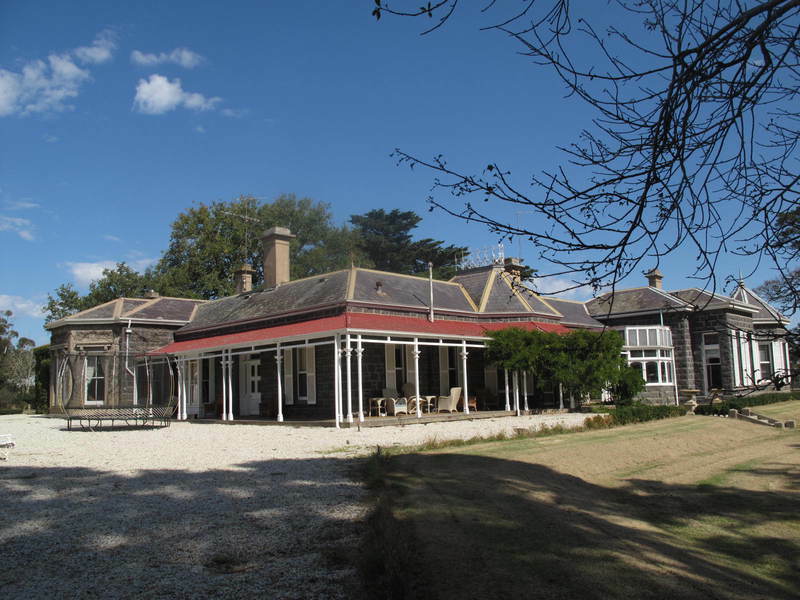 Barunah Plains Homestead is located approximately 48 kilometres west of Geelong in the Western District of Victoria. 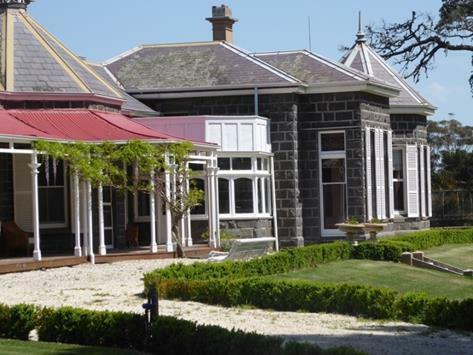 This volcanic stony country was occupied by squatters from the late 1830s and was held by the Russell family after acquisition in 1851 until 1978. Barunah Plains commenced as a pastoral run in the late 1830s. In the late 1840s James Austin applied for the lease of the Long Water Hole run, later to become Barunah Plains. 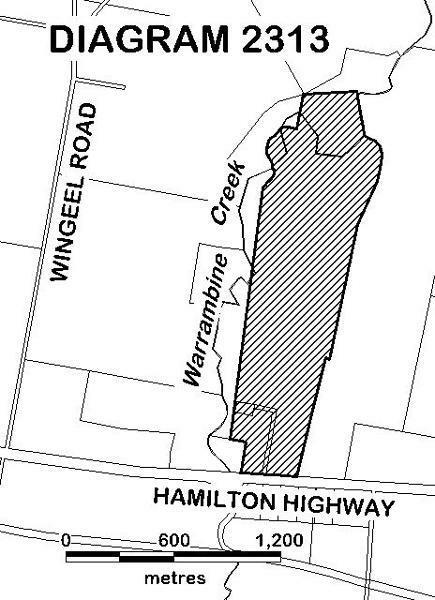 Consisting of approximately 50,000 acres (20,000 hectares) of land between Inverleigh and Cressy, it was a run he had already occupied for some time. Austin had established a sheep run on this property when he disposed of his land, stock and station to Philip Russell, John Simson and Thomas Russell. In 1854 Thomas Russell's 640 acre (260 hectares) pre-emptive section was clearly recorded on a Department of Lands and Survey Plan. 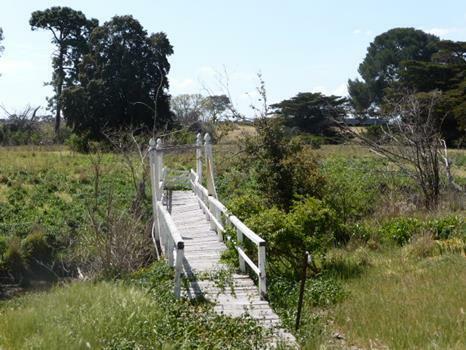 The main allotment was situated on the east side of the Warrambine Creek, with an adjoining 80 acre (32 hectare) allotment to the west of the creek. A home station, woolshed (on adjoining land) and several huts clustered along the Warrambine Creek are shown on this plan and the station reportedly held some 26,000 sheep at this time. The company, Thomas Russell & Co (Thomas Russell together with brothers William, James and George in Scotland) was formed when Philip Russell and Simson withdrew from the partnership, and the newly formed company had obtained the first freehold rights to the Long Water Hole run by 1856. Thomas Russell continued to expand his land holdings by purchasing substantial tracts of surrounding land after subdivision occurred in the area in the 1850s and he settled on a property to the north-west of the present Barunah Plains. Acquired in 1857, this property became known as Wurrook. Long Water Hole had been renamed Barunah Plains by the late 1860s. In July 1867 Thomas Russell and James Kininmonth, the resident property manager from the early 1850s, commissioned architects Davidson and Henderson to design a homestead for Barunah Plains, and the next month Thomas Russell engaged these architects for additions to his residence Wurrook. This architectural partnership was not actually formed until early 1869 however Alexander Davidson had already established an architectural business by this time and Henderson arrived as his assistant in 1867. Designs for the Barunah Plains homestead were completed and tenders were called and advertised in the Geelong Advertiser on 4 October 1867. 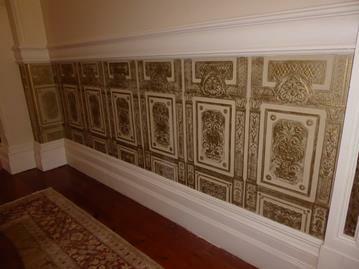 McLauchlin and Dobbie of Geelong were awarded the contract and the mason's work was undertaken by Foyle and Baker. The total cost of works was £1596/13/- and the final account for the work was rendered in August 1868. 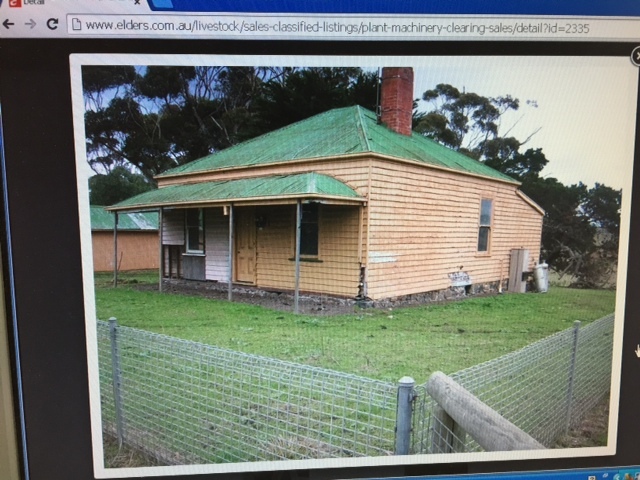 This original single storey bluestone house at barunah Plains formed the basis of the homestead that developed over the next 40 years. 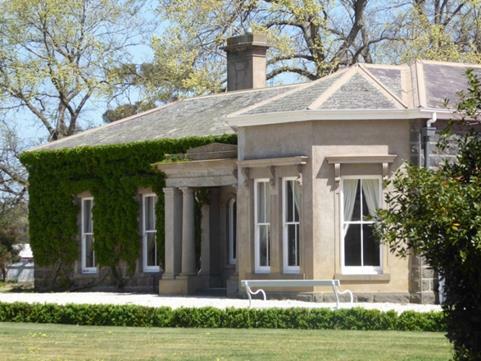 It was designed with a simple polygonal bay facing north towards the Warrambine Creek, in what has been described by Allan Willingham as amongst the first hesitant excursions into the comparatively unfamiliar language of the Italianate style. This first portion of homestead had a timber framed verandah along the north and east facades. Thomas's brother George Russell became the sole owner of the Barunah Plains property in 1877. Living in Fife, Scotland, George never visited Australia and sent his son James to manage the property. By 1888 Barunah Plains was a freehold property of 50,000 acres (20,234 hectares). James purchased Barunah Plains twenty years later in 1897 and managed it until his death in 1911. Barunah Plains continued to be managed by the Russell family, firstly by James' eldest son George Kincraig Russell until his death in 1915, then by Trustees before James Kincraig Russell took over the property in 1922, residing at nearby Wingeel. He continued to manage the property until his death in 1966 and his nephew George then managed the property until the family finally sold it in 1978. At this time it had been in the possession of the Russell family since 1851. Additions were reportedly made to the homestead in 1886. 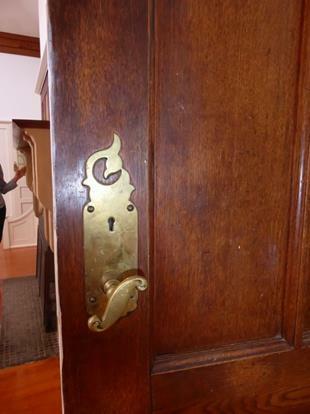 No record of this work has been found however it is physically and stylistically evident that work was undertaken at the homestead in the 1880s boom period. 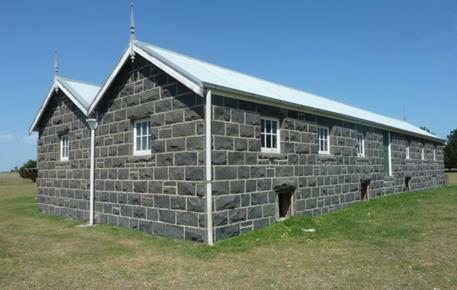 At this time a large bluestone wing was added to the south of the 1867 homestead and this remains largely extant. It is a single storey wing with prominent rendered polygonal bay and adjacent entrance through a pedimented Doric portico. At the time this became the main entrance to the house, with a wide hall and principal rooms either side, all with elaborate interiors. The billiard room to the south may also have been added at this time. A square bay window was added to the room at the south end of the original section and the adjacent original entrance retained. After the financial crash of the 1890s, the second generation of pastoralists sought to modernise their homesteads and a number turned to the younger generation of Arts and Crafts architects. This included the owners of Barunah Plains who employed local architects, Tombs and Durran, to enlarge and modernise the homestead. In May 1903 Tombs and Durran called for tenders in the Geelong Advertiser, 30 May 1903 for bluestone additions to Barunah Plains for James Russell. A year later, in December 1904, Tombs and Durran called tenders for bluestone additions to the woolshed at Barunah Plains (Geelong Advertiser, 10 December 1904, p 8) and in April 1908 they called tenders to erect a brick homestead and stables at Barunah Plains (Geelong Advertiser, 25 April 1908, p 5). 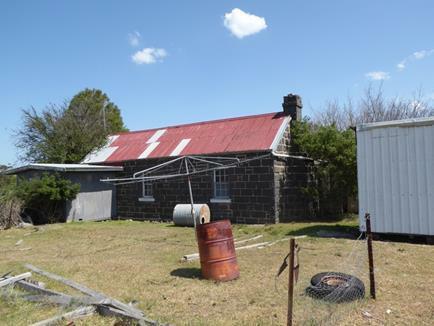 This homestead, named Wingeel, was built for G K Russell on land to the west of Barunah Plains. The 1903 bluestone addition at Barunah Plains is an extension to the west of the original homestead. It is a single storey section, set slightly forward from the existing facade, with a small connecting conservatory section. 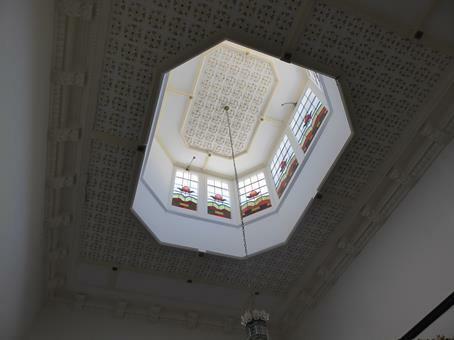 The new building contains both a square bay and a polygonal bay with octagonal turret roof. Presumably at this time the original courtyard was enclosed to create a large ballroom with a raised highlight roof. 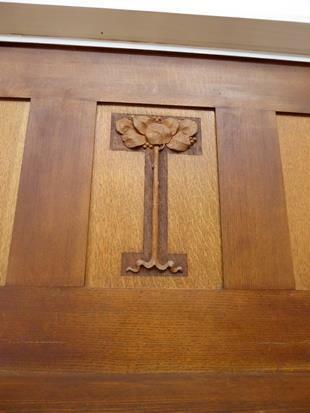 The interiors of all these additions were executed in a highly distinctive Federation Arts and Crafts style and contain unique hand-crafted fittings. 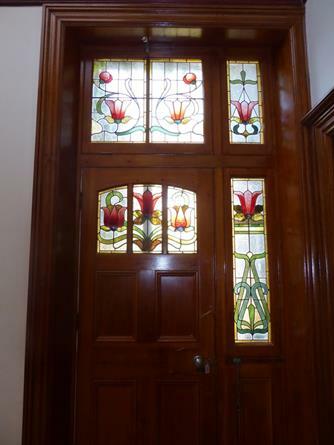 High quality examples of stained glass, timberwork and metal work, are seen throughout these additions and also thorughout the homestead. It was reported in The Pastoral Homes of Australia in 1910 that an electric lighting plant had been installed in an engine house at the property with the capacity to store electricity in the batteries for a week. This provided power to drive twenty machines during the shearing period. It was also reported at this time that numerous tanks and windmills were working on the estate to water the property. Like much of the surrounding countryside Barunah Plains was established as a merino sheep stud and developed into a substantial and prosperous establishment by the Russell family. From 1880 Barunah Plains was well represented at wool shows and the estate won numerous prizes. 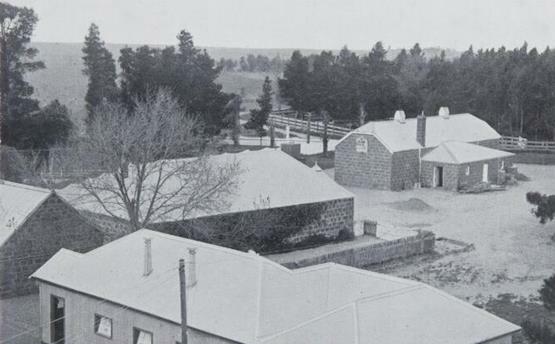 By 1910 Barunah Plains was described as one of the finest wool growing estates in the Western District of Victoria in the publication The Pastoral Homes of Australia. Comprising 51,000 acres (20,640 hectares) of volcanic stony rises and hard plains, the land was described as devoid of timber, but healthy for stock with a good climate for wool growing purposes. 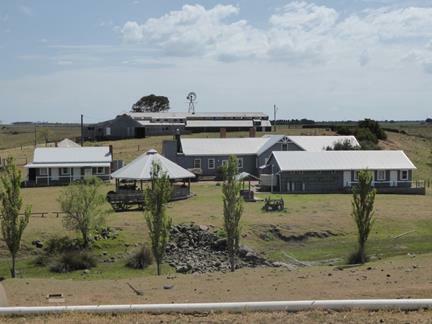 The property was consistently described as one of the leading merino fine wool sheep breeding establishments in the country and throughout the first half of the twentieth century many detailed articles about Barunah Plains appeared in newspapers, highlighting its importance as a merino sheep stud. It was described as holding one of the oldest merino flocks in Victoria in The Australasian, September 1918. 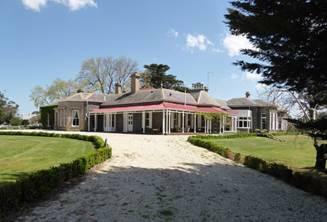 In 1937 it was described as the home of one of the most famous and perhaps best known and largest merino flocks in Victoria and in 1938 as one of the best and most valuable pure merino breeding studs in Australia. The homestead . is of solid bluestone and of pleasing design, showing workmanship that was only obtained in the early days of settlement . The garden and grounds are generously laid out and most picturesque, while all the outbuildings are substantially put up, mostly of bluestone. 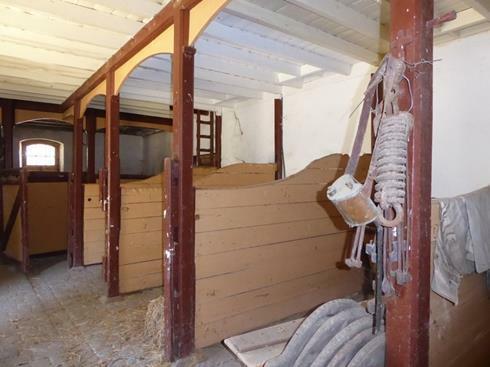 The woolshed is of stone, and is provided with 20 machine stand . there are over 70 miles of rabbit-proof stonewall. In 1929 a booklet was produced about Barunah Plains, which was described as the property of the Executors of the late James Russell. 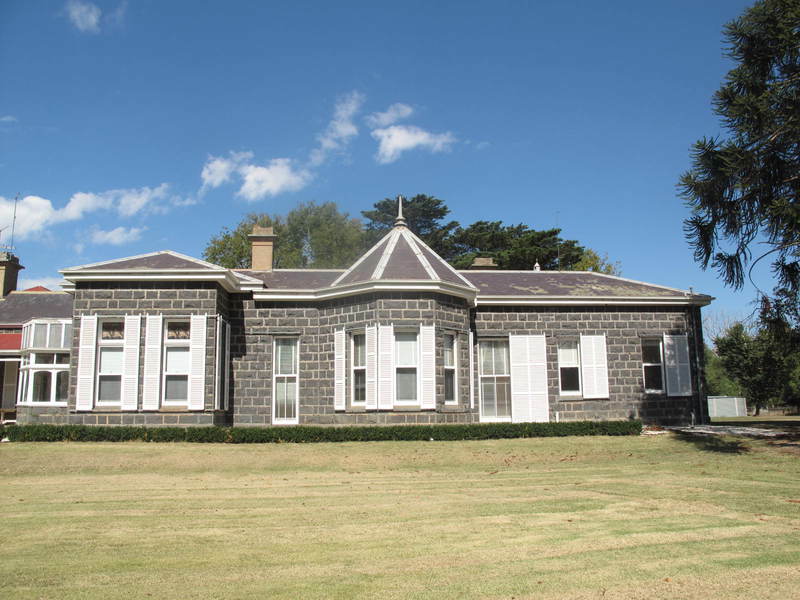 The estate was described at the time as one of the most valuable assets possessed by the State of Victoria. It comprised 46,000 acres (18,600 hectares) of freehold at the time. Like many other properties in western Victoria, a large portion of Barunah Plains was acquired by the Soldier Settlement Commission in 1949. At this time some 21,000 acres (8,500 hectares) of the property was acquired and some 23,000 sheep were sold. As a result the Barunah Plains holding was reduced to almost half of its original size. The Russell family sold the Barunah Plains property in 1978. It was subsequently opened as tourist accommodation to supplement the farm activities and a golf course was added to the property in the 1990s. The property was sold in 2001 and again in 2016 and no longer operates as a tourist facility. 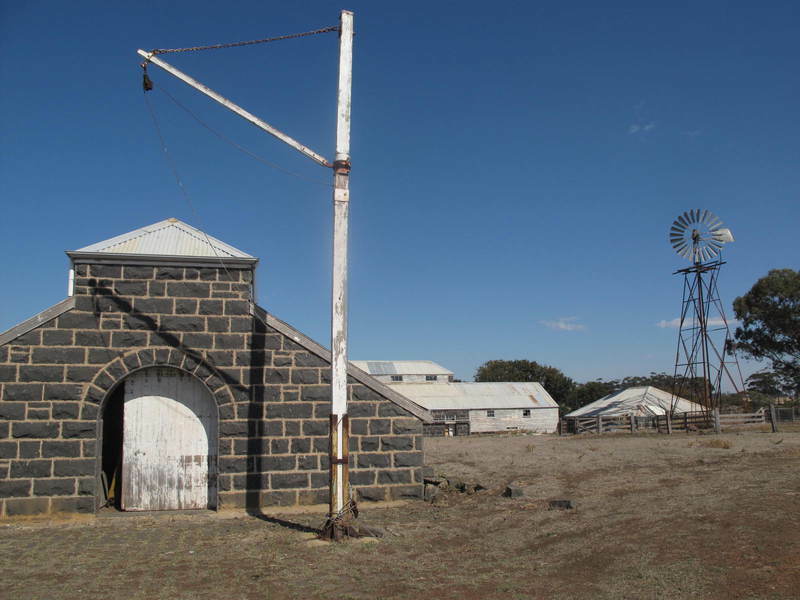 Owned by the pioneering Russell family from 1851 to 1978, this pastoral property developed into a highly successful Victorian sheep station. 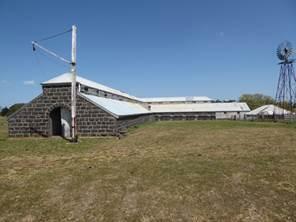 It contains a fine collection of farm buildings including a large T-shaped bluestone woolshed.
. Repairs and maintenance which replace like with like.
. Removal of non-original items such as air conditioners, pipe work, ducting wiring, antennae, aerials etc and making good in a manner appropriate to the heritage fabric of the place.
. Installation or removal of non-original external fixtures and fittings, such as hot water services and taps, of contributory elements in a manner not detrimental to the cultural heritage significance of the place.
. Painting of previously painted walls and ceilings provided that preparation or painting does not remove evidence of any original paint or other decorative scheme.
. Demolition or removal of non-original stud/partition walls, suspended ceilings or non-original wall linings (including plasterboard, laminate and Masonite), non-original glazed screens, non-original flush panel or part-glazed laminated doors, aluminium-framed windows, bathroom partitions and tiling, sanitary fixtures and fittings, kitchen wall tiling and equipment, lights, built-in cupboards, cubicle partitions, computer and office fitout and the like.
. 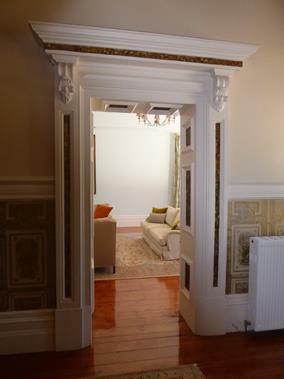 Installation, removal or replacement of ducted, hydronic or concealed radiant type heating provided that the installation does not damage existing skirtings and architraves and that the central plant is concealed, and is done in a manner not detrimental to the cultural heritage significance of the place.
. Installation, removal or replacement of non-original light fittings and lamp shades. Demolition and all works to buildings of no cultural heritage significance that do not increase the footprint of the building. This includes all farm structures and buildings not listed above in the proposed permit policy as being of primary cultural heritage significance.
. Repairs and maintenance to hard landscape elements, such as driveways, stone walls, steps, paths, tennis court, swimming pool, gutters, drainage and irrigation systems, in a manner which preserves the cultural heritage significance of the place.
. The removal or pruning of dead or dangerous trees to maintain safety and to protect buildings and structures. If the tree is identified as being of primary or contributory cultural heritage significance, the Executive Director must be notified of these works within 21 days of them being undertaken.
. Replanting of removed or dead trees and vegetation with the same plant species to conserve the significant landscape character and values.
. Cultivation, cropping, harvesting, grazing stock, and other activities associated with agricultural or pastoral uses, excluding buildings or works associated with those activities other than maintenance or repair or demolition of any non-original fence, gate, dam or structure necessary for the continuation of agricultural or pastoral activities. The extent of registration of Barunah Plains, Hesse in the Victorian Heritage Register affects the whole place shown on Diagram 2313 including the land, all buildings, roads, trees, landscape elements and other features. Under the Heritage Act 1995 a person must not remove or demolish, damage or despoil, develop or alter or excavate, relocate or disturb the position of any part of a registered place or object without approval. It is acknowledged, however, that alterations and other works may be required to keep places and objects in good repair and adapt them for use into the future.
. If works are proposed which have the potential to disturb or have an impact on Aboriginal cultural heritage it is necessary to contact the Office of Aboriginal Affairs Victoria to ascertain any requirements under the Aboriginal Heritage Act 2006.
. If any Aboriginal cultural heritage is discovered or exposed at any time it is necessary to immediately contact the Office of Aboriginal Affairs Victoria to ascertain requirements under the Aboriginal Heritage Act 2006. The cultural heritage significance of Barunah Plains, Hesse lies in its long history as an important Western District sheep stud. The large and intact collection of outbuildings and structures, many constructed of bluestone, make a significant contribution to the significance of the place. The significance of the homestead building lies in the main stages of its construction which are apparent in its external form and fabric, and in particular in its notable and highly intact Arts and Crafts interiors of the 1903 additions. 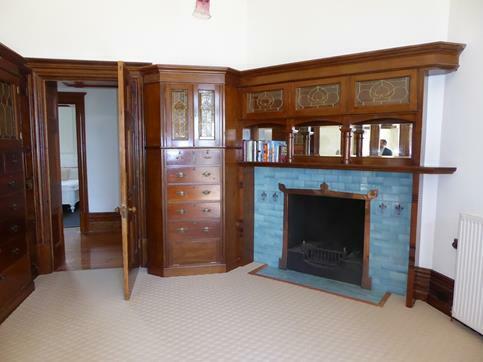 This includes outstanding timber, metal and tile work and stained glass in the rooms of the west wing and the ballroom. This section identifies buildings and features at the place and attributes a level of cultural heritage significance to them.